1 Have you ever wanted a snake for a pet? Corn snakes make good pets. These snakes are docile. They are easy to handle and aren't eager to bite. Corn snakes are simple to care for. They are attractive and can have a long life span. A pet corn snake can live for over twenty years! 2 Corn snakes aren't poisonous. They use constriction to kill their prey. The corn snake grabs a mouse and bites it to keep it from getting away. Then the snake wraps itself around the mouse and squeezes. When the mouse is dead, the snake swallows it whole. Sometimes a corn snake will swallow a live animal. Corn snakes eat mice, rats, birds, and bats. 3 Corn snakes are diurnal animals. They are active during the day. 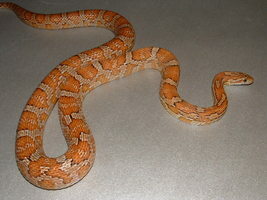 Corn snakes live in the eastern U.S. from New Jersey through Florida. They also live in southern states as far west as Texas. Corn snakes can climb trees. They like living in fields and forests. They also hang out in empty buildings. They are solitary and secretive snakes. They like to hide under bark or rocks.